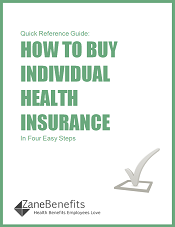 Zane Benefits, the #1 online health benefits solution, announced today the publication of two new slip sheets "How to Buy Individual Health Insurance" and "The New Advantages of Individual Health Insurance." The two quick reference guides help employees and employers understand the benefits of individual health insurance. According to Zane Benefits, employers all over the nation are transitioning from traditional employer health insurance to "pure" defined contribution health benefits, paired with individual health insurance. This type of strategy has major benefits for the employer and employees alike. However, change is hard and employees need additional education on how to buy an individual health insurance plan and the advantages to them and their family. With individual health insurance, employees pick the plan that best fits their needs, can keep the same plan for as long as they want, and save money with new healthcare subsidies. Employers can continue to cover employees' healthcare costs (and save on the cost of healthcare) with a "pure" defined contribution health plan. The two slip sheets are excerpts from Zane Benefits' popular guide "The Ultimate Guide to Individual Health Insurance." 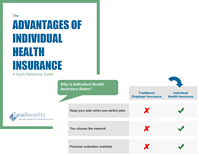 Employees, small businesses, HR managers, and CEOs should download these two guides to educate employees, and their business, about the benefits of individual health insurance. Zane Benefits, Inc., a software company, helps employers, insurance brokers, and accountants take advantage of new defined contribution health benefits via its proprietary SaaS health reimbursement arrangement (HRA) software. Zane Benefits does not sell insurance. Using Zane’s platform, insurance professionals and accountants offer their clients a custom defined contribution plan. Learn more at www.zanebenefits.com. Disclaimer: The information provided on this website is general in nature and does not apply to any specific U.S. state except where noted. Health insurance regulations differ in each state. See a licensed agent for detailed information on your state. PeopleKeep, Inc., does not sell health insurance.